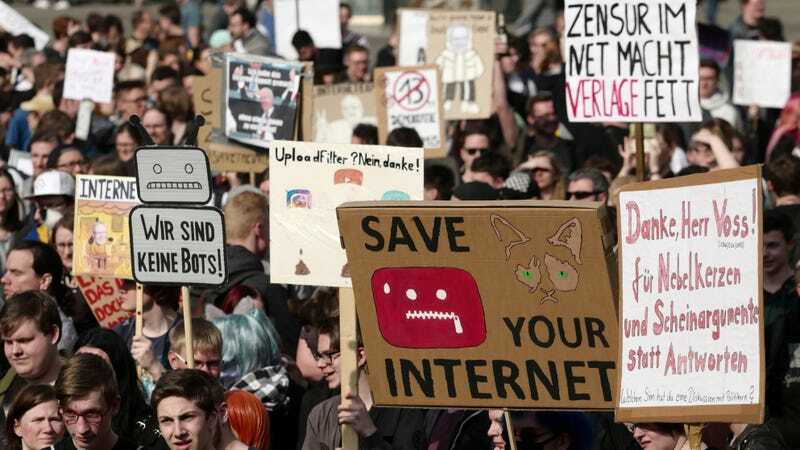 Protesters opposing the Directive on Copyright in the Digital Single Market by the European Union in Leipzig, Germany, on March 23, 2019. 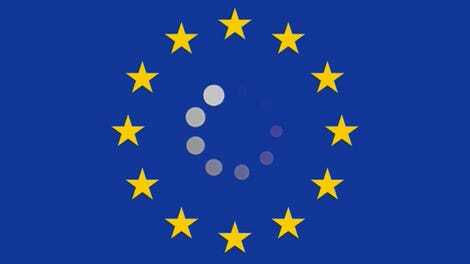 The European Parliament approved a massive, sweeping overhaul of online copyright rules on Tuesday, leaving the extremely controversial Articles 11 and 13 untouched on as the EU Copyright Directive cruised through the legislative body. According to a report on TechDirt, they may have done so in part because several members of the European Parliament cast incorrect ballots on a key vote to allow amendments. Article 11, sometimes called the “link tax” by detractors, requires web platforms to obtain a license to link to or pull quotes from news articles. It is ostensibly intended to ensure that publications get a slice of the revenue that big services like Google News pull in, but critics say it could undermine the ability of users to share content across the web. Article 13 requires platforms make their “best efforts” to obtain licenses to copyrighted material before it is ever uploaded to their servers, changing the current standard in which they respond to copyright takedown request from rights holders. The fear is that platforms will turn to oppressive filters that prevent users from uploading anything that could potentially violate copyrights, or—considering the sorry state of existing content filters—arbitrarily block user-generated content that filters mistakenly is in violation of one copyright or another. The cost of setting up such technology may also tighten, rather than loosen, the grasp of massive companies like Facebook and Google on the internet, as smaller competitors may not be able to deploy it. ... A few hours later, the EU put out the official voting record which includes an astounding 13 MEPs who said they voted incorrectly. Ten of them said they meant to vote for amendments. Two of them said they wanted to vote against it. And one did not want to vote. The EU’s official voting record was then updated to reflect those 13 members voted incorrectly, although that correction will only live on paper. It’s too late to call a mulligan. The plus and minus signs indicate votes that respectively should have been cast for or against allowing amendments, while the 0 indicates a representative who meant not to vote at all. Masnick called it “frustrating beyond all belief that we ended up killing the open internet through tricking a bunch of MEPs by switching the voting order.” However, there did not appear to be any indication as to what motivated the switch in voting order. (That it could have been boneheadedness, rather than malice, that drove the dagger is cold comfort.) There is also no way to say with certainty whether the offending articles would have actually ended up being modified or stripped in the amendment process. The unamended version passed overwhelmingly at 348 in favor and 274 against. The muck-up may have guaranteed that Articles 11 and 13 made it into the version passed by the European Parliament, but it does remain to be seen whether the worst-case scenario feared by open internet advocates will materialized. As CNN noted, there is a “high degree of uncertainty about how the law will be applied,” as member states will implement their own schemes in accordance with the directive and courts will play a role in interpreting how it should be applied. Cory Doctorow of the Electronic Frontier Foundation, which opposed the Copyright Directive, noted in a blog post earlier this month that many parts of the law are ambiguous. For example, Article 11 “allows member states to ban links to news stories that contain more than a word or two from the story or its headline, but it only requires them to ban links that contain more than ‘brief snippets,’” Doctorow wrote. That ambiguity works both ways; while individual member states may choose to implement looser regimes around the rules, tech companies might choose to engineer their products around the strictest EU member state implementations to minimize the costs of compliance.